FEATURES: Capelet is made from vintage cotton velvet (made in West Germany in 1950s) lined with organic pure cotton flannel; Cruelty-free pure silk (fair trade handwoven in India) ruffles on both sides of capelet lined with organic cotton flannel; Front embellishments are an assortment of ‘pearlescent’ buttons made of plastic in various sizes; Vintage 1970s stock Japanese-made petite pearlescent buttons made of acrylic plastic in an ivory colour are dotted on the front of capelet, collar, & hem; V-shaped neckline decorated with English-made cluny lace; Hem. 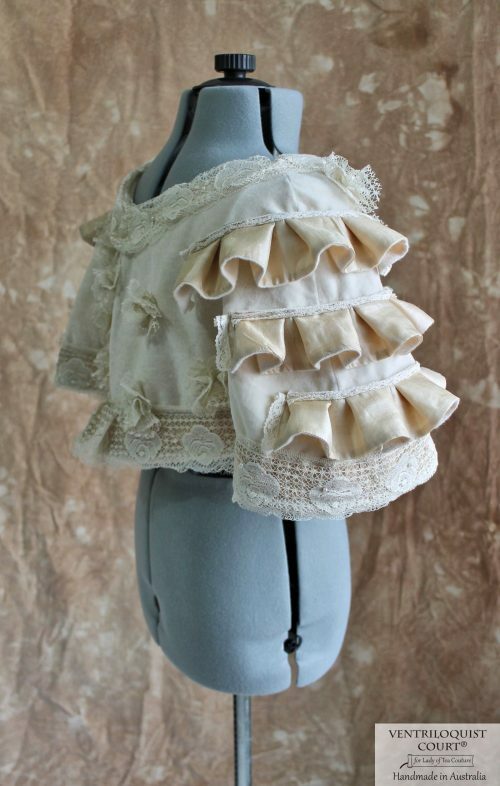 front, & back are also decorated with cluny lace (made in England) as a trim as well as formed into floral ‘buds’; & capelet closes at front with brass tone metal parachute clips in a vintage style. Note: all fabrics used are fair trade, artisan, or vintage.